From the main menu select the 'Subtitles' option. Now, highlight the 'Menu' option and arrow RIGHT to highlight a blue arrow. Press your Enter button to view the disc's production credits. 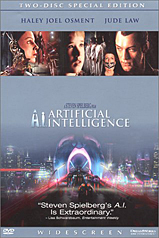 Disc 2: Select "Robots of A.I". Use your remote to advance to 06:05 to watch footage of Teddy. Disc 2: Select "Special Visual Effects & Animation: ILM"
Use your remote to advance to 01:08 to watch footage of Teddy.